Want more information, have a request or want to place an order outside of the shopping cart? Please contact me. *Looking for Feathered and Beaded Cabochons, Horsehair, Quills, Lacings and other Special supplies? *Looking for Heishi, Turquoise Cabochons and Arrowheads? 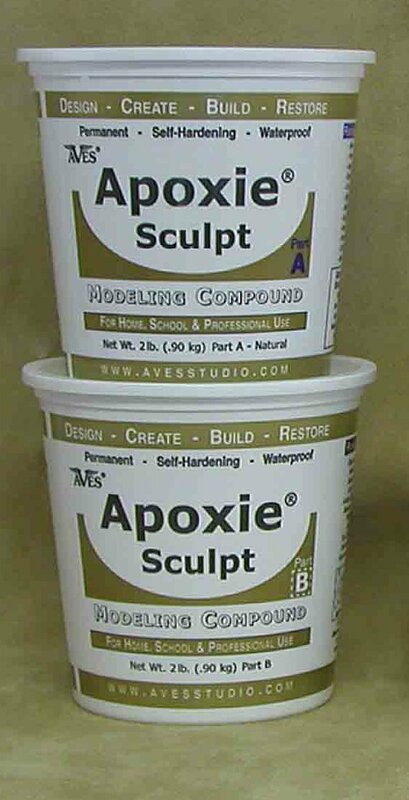 Apoxie Sculpt is the toughest, strongest, sculpting clay you can use for your gourd projects. Unlike most air dry clays, large applications don't crack or shrink as the sculpting material dries, and the finished result is super hard and durable. (It's so strong that many gourders are using it as a "moldable glue" for attaching gourd pieces together.) The cured material can be carved, sanded, painted or even turned on a lathe! Unlike polymer clays, this is a two part product that hardens after mixing - no baking is required. Use this product when strength is important - you'll be amazed how strong even the smallest details are when they are made from Apoxie Sculpt. NON hazardous, NON Flammable, NO fumes, user friendly clay! Safety Solvent is recommended for smoothing, texturing, and clean up of Apoxie Sculpt (It even cleans dried sculpting material!) It is especially useful when working with black or bronze apoxie sculpt as it makes it much easier to clean up any residue. *Looking for Turntables, Stands, Dreamcatchers, Nightlight kits, Pitt Pens, and more? Sandy Phillips of New Mexico did a wonderful job on this "Fall Tree" gourd. She used an armature to build the branches, then covered them with apoxie sculpt for strength. The finished tree is very firm and solid. 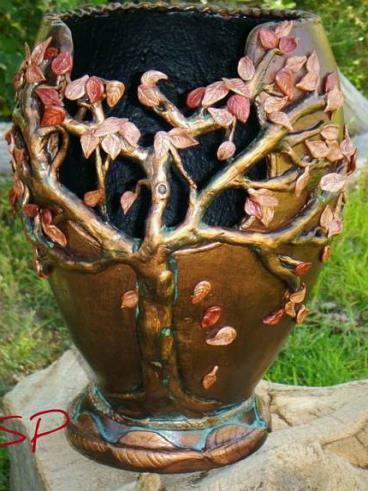 She used bronze apoxie sculpt to make and attach the leaves so they would be solid as well. You can see more of Sandy's gourds on her website or on her GAE page. 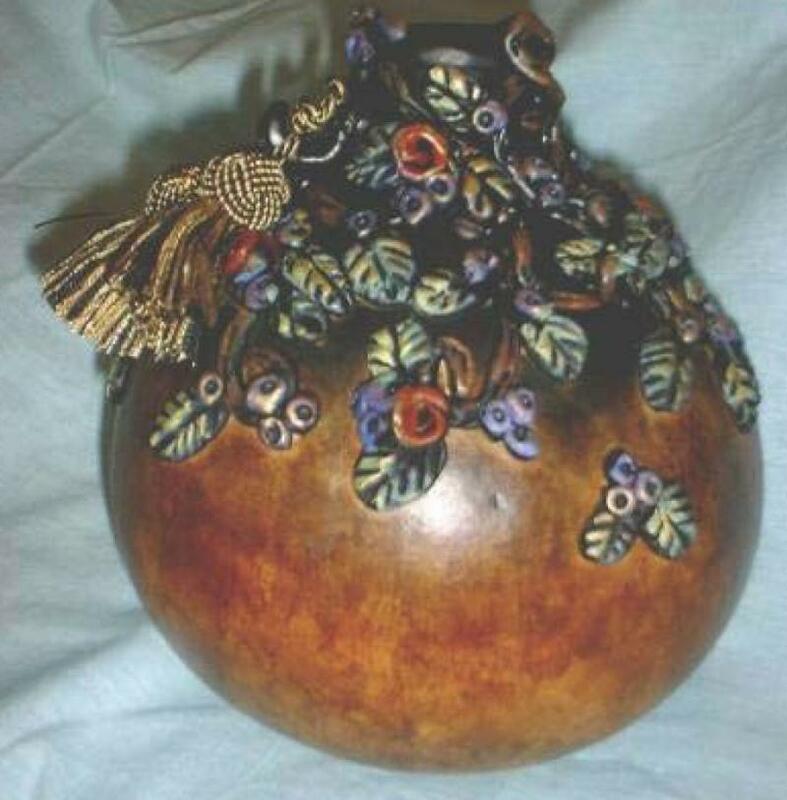 Sherry Goshen of Iowa wrote a great tutorial about using Apoxie Sculpt to create this floral gourd. You can read the complete tutorial in our February 2010 Arizona Gourds newsletter. Sherry has an art blog where there are photos of many other projects. Right: Phyllis Sickles of Arizona uses Apoxie sculpt for all of her great bird and creature sculptures. Legs are created with wire armatures that are covered with Apoxie Sculpt and then carved and painted. 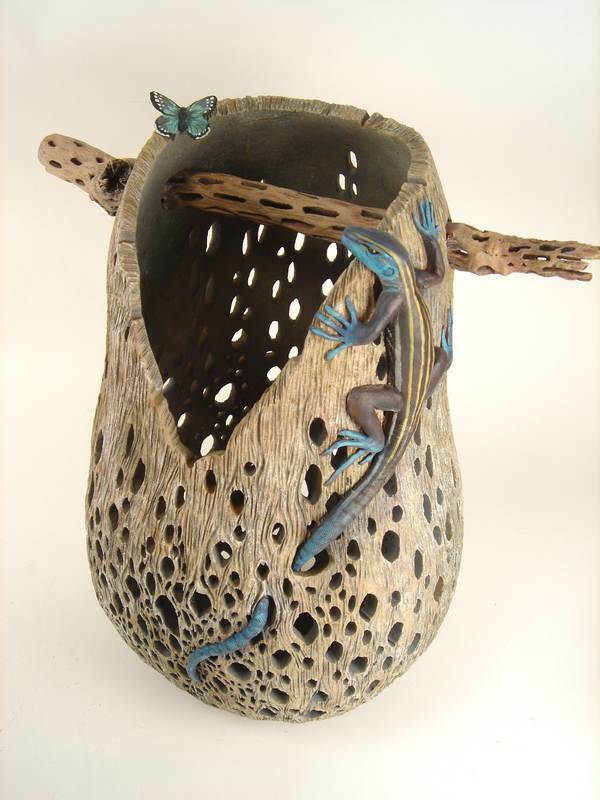 You can see more of Phyllis's gourds on her website. NEW! 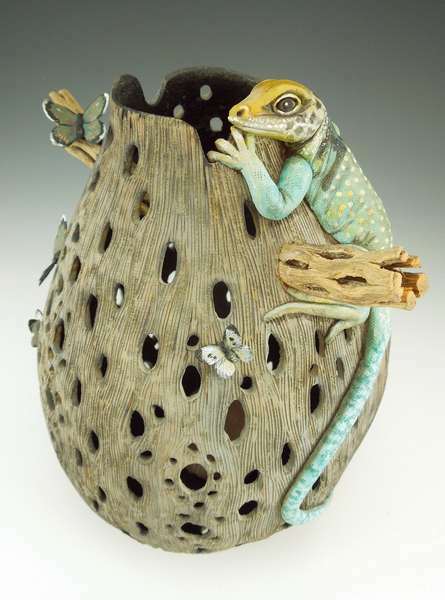 Visit our artists gourd gallery - works of art created with Apoxie Sculpt. Below: I made these gourds using Apoxie sculpt for the lizards. They were made from Bronze Apoxie and then painted with acrylics. 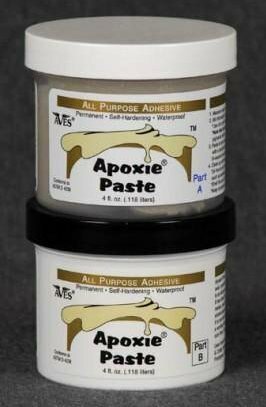 A thinner consistency than Apoxie Sculpt, batter-like Apoxie Paste can be used to waterproof the inside of gourds. It's an adhesive, a filler and a sealer all in one! Can be tinted with pigments, and has a 1-3 hour working window. Cures hard and adheres to just about anything including foam. Similar to Apoxie Sculpt or Quikwood, PC Lumber is a two part epoxy clay that can be used for sculpting or repairs. PC lumber is a natural gourd/wood color, and is easy to use. Simply slice off the amount you want, then knead the clay to mix the material. (There is an outer layer of catalyst and an inner layer of clay; no need for measuring, just slice and mix.) This is a strong adhesive so it's great for repairs or adding pieces and parts to your gourd sculpture, but it's also a workable clay for sculpting or forming. You'll have about 15 minutes of working time, the product cures totally in about an hour. $6 for a 1 oz. tube. Good for small projects or when a quick cure is needed! $10 for a 2 oz. tube. Buy the larger size and save. *Look for a review and photos of this product in use in the Arizona Gourds September 2014 newsletter. Critter clay will remind you of working with stoneware clay that has to be fired, but this is a tough air dry clay that be used for sculpting or textures on gourds. This product is used by taxidermists and is strong and easy to work with. Water cleanup. * Note - Due to the weight of Critter Clay, a shipping surcharge has been added to the base price. If not needed, it will be refunded.